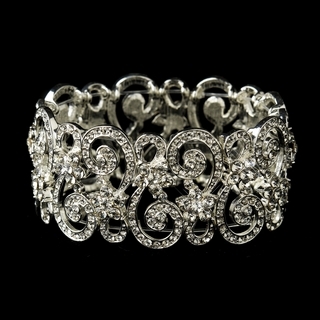 Our "Symphony" bracelet will adorn your wrist with an enchantment of vintage swirls and brilliant luster! This sparkling, stretchable wrist piece is filled with dozens of beautifully-crafted cubic zirconia crystals affixed to a silver-tone metal base. Whether you are accessorizing for a wedding, prom, or a formal dinner, this lovely bracelet will compliment any special occasion ensemble wonderfully! Size: This cuff bracelet is stretchable to fit most wrist sizes. The band measures 1.25" wide.